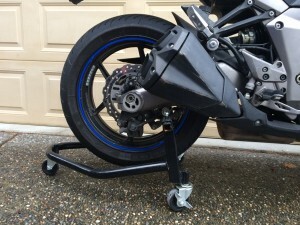 Consider front and rear stands a requirement for owing a motorcycle. It makes everything easy. If you make maintenance and cleaning easy, you will do it! Having the front and rear tires off the ground makes them easy to clean. Having the motorcycle higher off the ground also makes it easier to get at. Plus, it looks cool. Front and Rear stands can be bought for around $100 each. Money well spent. Your basic dollar store paint brush will do just fine. A 4-5 inch brush is ideal. 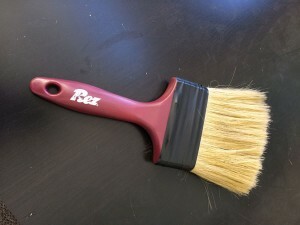 Most paint brushes have a metal case (holds the Bristles). Tape this off with electrical tape so you do not scratch your motorcycle. Get the brush good and wet, spray the cleaner on it and go to town. The soapy bristles will get in all the tight areas making the cleaning easy. The brush works great on your wheels as well. This is a tough de-greaser which will remove almost anything. Especially grease and oil. 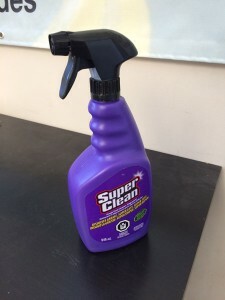 Since it is a tough cleaner, do not leave it on your motorcycle too long (30 seconds). 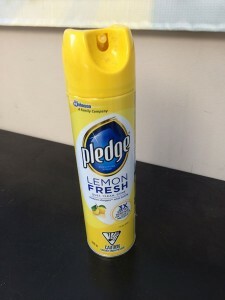 It can clean more than you want. Clean a section, spray down, move on. 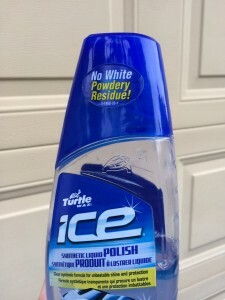 You can use this all over your motorcycle but it can clean the wax off too. Just reapply the wax and you’re good to go. These two products are perfect for the deep shine you are looking for. They do not leave a white residue. Apply and wipe it in with a microfiber cloth until smooth. Since it is easier to apply it will come off easier. Several applications is still quicker and easier versus the wax pastes. Cleaning your chain is a once in a while chore that is not easy. It is a dirty, messy job. With kerosene, tooth brush, and a rag. You’ll be done in 10 minutes or less. 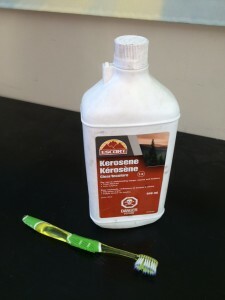 Kerosene is the best cleaner for your chain. Since it is a fuel, it breaks down grease quickly. The oil in the kerosene will also keep the chain from drying out. You do not want a dry chain. Always keep it will lubricated. 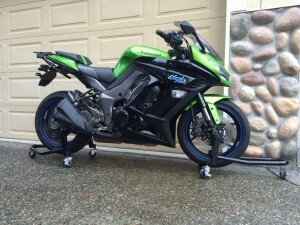 Once done spray down with your favorite chain lube and wipe away any excess. Done.